to do this kind of piece. I have a few more planned right behind it. Every piece needs to reflect a new challenge to keep my interest. Maybe that's telling. If it's not challenging, I can get bored easily. The fun here is that I get to use other textures ... milled and aged wood, metals, glass, paper, etc. Plus, I like the opportunities to use puns and signage ... makes it easy. 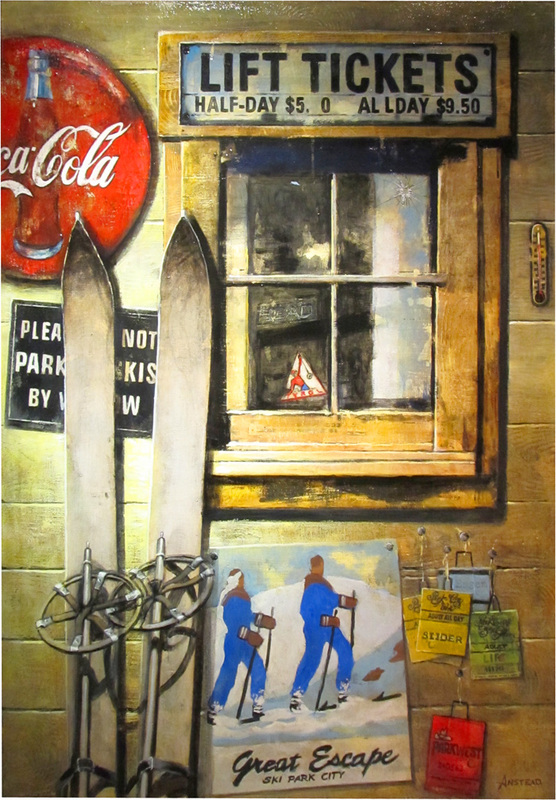 This piece features vintage #ski imagery, and I added an homage to Utah ski resorts of yesteryear with old lift tags pinned on the lower left. Did you ever ski at Park West? It's now #The Canyons. Like I've always said, there's never a time where I run out of things to paint.